Nick (aka the boss) Nick had been with Cairns Fishing Charters for several years working for the previous owner, and purchased the business in 2014. 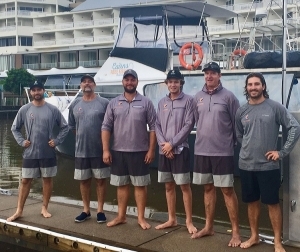 His parents were pioneers of the Whitsunday charter boat scene and he commenced his maritime career there. He has worked as a commercial fisherman, fish shop owner, marine engineer and has skippered vessels all over the world.He loves boats and is passionate about the marine environment. With a great big smile & warm personality Kate or Annika will greet you on the morning of your charter, they will sort out your paperwork** and wave you off from the Marina. **Paperwork includes: Terms, Conditions and Legal Waiver and Release of Liability Claims and Assumptions of Risk Acknowledgement to be signed by each individual before vessel departs. 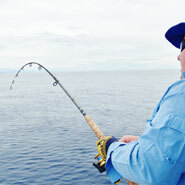 Cairns Reef Fishing provides comfortable, safe and enjoyable charter trips to the Great Barrier Reef and beyond. Our boats include; Blue Whaler a 42 foot Randell, Aqua Cat a 48 foot Randell and Reef Runner 37 foot Kelvacat. All our vessels are fitted with the latest in electronics, safety and fish finding equipment and are fully equipped with undercover decking area, seating for all and full size toilet facilities. The Aqua Cat is surveyed to carry up to 34 Passengers, however, for passenger comfort we cap the number to 14 on share charters. 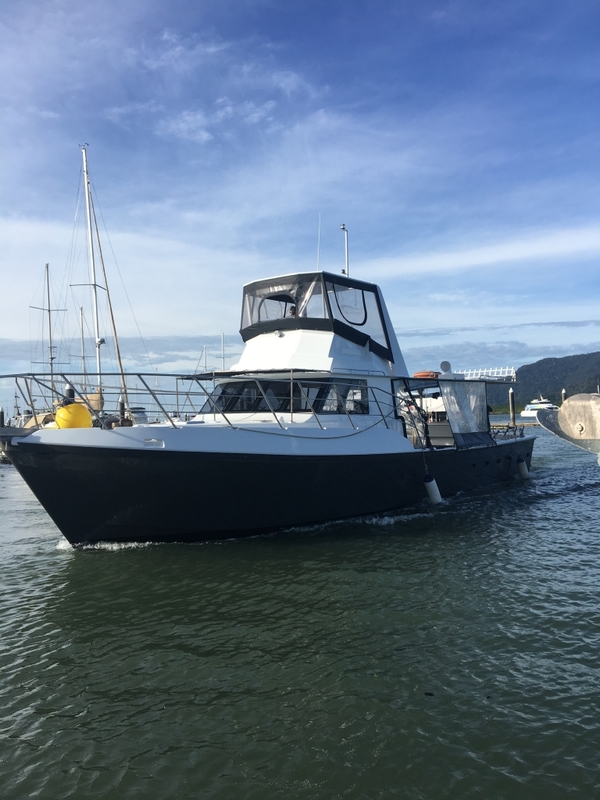 We will take up to 20 on sole charters but suggest that 15 is the most that can fish at once .She has a cruising speed of 14 knots and large spacious rear deck. Reef Runner is our latest high speed charter vessel. Modern 11m Kelvacat. Now available for PRIVATE CHARTER up to 8 passengers. Reef Fishing, Snorkeling, Light Tackle Game, Sportfishing, Transportation + Logistics. She has a cruising speed of 22knots. The Blue Whaler is surveyed to carry up to 24 passengers, however, for comfort we cap the number to 12 on share charters and 13 on Private Charter. The Blue Whaler recently underwent a full refit and boasts a new comfortable interior and improved rear deck space. She has a cruising speed of 14 knots and is very stable for her size. A full range of quality fishing gear is provided, including new Fin Nor, Shimano and Penn reels as well as handlines for those who, like our crew, prefer this method. We hand make all our own rigs and are constantly updating our fishing methods and equipment. Our knowledgeable crew can also happily show you how to use all of the gear. 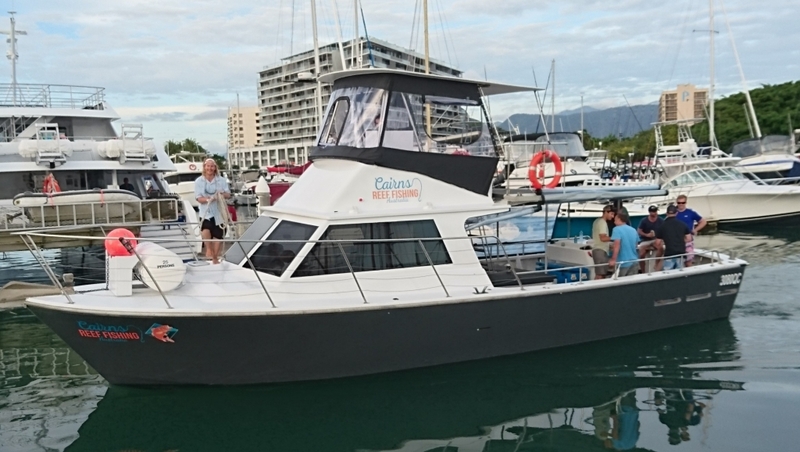 Your Cairns Reef Fishing experience begins at Cairns’ Marlin Marina. The boats are berthed at D Finger (see the map on the Contact page) behind the Shangri La Hotel. On the way out to the reef we will troll some lures. 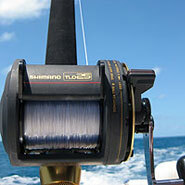 This can result in hook ups of large Dolphin fish, Mackerel, Wahoo, Sailfish, Marlin and different varieties of Tuna. We set the lures then hand the rod to you, so be ready for some reel screaming action! We will be right behind you offering encouragement and ready to help you safely land your fish. 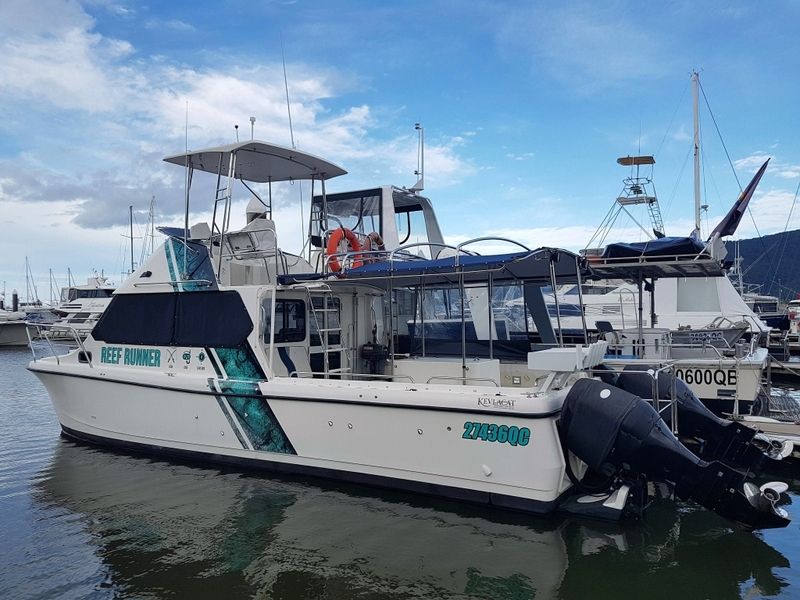 Out at the reef we will be targeting Coral Trout, Red Emperor, Large and Small Mouth Nannygai, Sweet Lip, Cod, Trevally, GT’s and many other reef species. 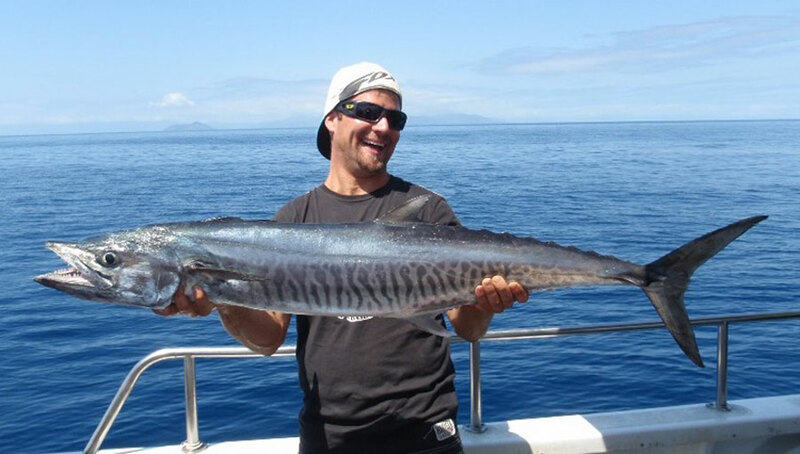 We will be generally fishing on the bottom or close to it and usually in 30 – 60 meters depth. We will also put out some surface baits targeting Mackeral or Cobia. Be warned that we expect to land fish up to 10kg or bigger so hang on! A great day of fishing, a delicious lunch and maybe even a cold beer on the way home, it doesn’t get any better than that. Fishing is a popular recreational pastime that allows people to spend time on the water with family and friends and to get in touch with the natural world. 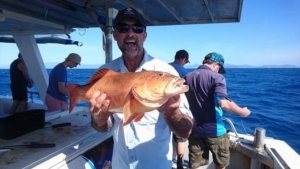 The Great Barrier Reef Marine Park offers many exciting and different fishing opportunities in a well-regulated and monitored system of zoning areas, including no take zones. As well as observing fishing regulations, it is important that those who fish adopt responsible fishing practices while out on the water. These practices help reduce impacts on the natural environment, maintain the ecological balance of the area and minimise harm to fish. 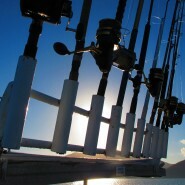 Cairns Reef Fishing is passionate about our marine environment and we strongly support a sustainable fishing resource. We adhere to the Great Barrier Reef Marine Park Authority Responsible Reef Practices and Queensland Fisheries catch regulations. We aim for best practice in our conduct on the Great Barrier Reef in the following ways. We advise our clients about all fishing regulation and best practices. We provide interpretation about sustainable fishing practices, species identification and measurement, protected fish species such as Maori wrasse, and barramundi cod. Explain why the Great Barrier Reef Marine Park is a special place and the reasons for fishing regulations. We encourage our customers to take only what they need. We do not fish near commercial dive sites or pontoons. We do not fish at known or suspected fish spawning aggregation sites. We fish a safe distance from marine animals (such as dolphins, whales, turtles and dugongs) and bird roosting or nesting areas. We return all undersized and unwanted fish to the water quickly to minimise injury and we use industry best practice to return unwanted fish. We euthanize kept fish in a timely and humane manner. We do not litter – we clean up all fishing gear (such as discarded tackle and line, and bait bags) and take it back to shore to dispose of it properly. 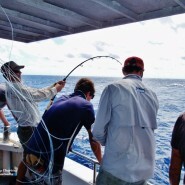 We participate in fish monitoring and research programs through the Qld fisheries department. We avoid damage to fragile corals by only anchoring in depth of water where these corals do not live and using quick release anchor systems. We believe that by following these simple guidelines we are helping to ensure that the Great Barrier Reef Marine Park continues to be one of the best spots on earth to fish.